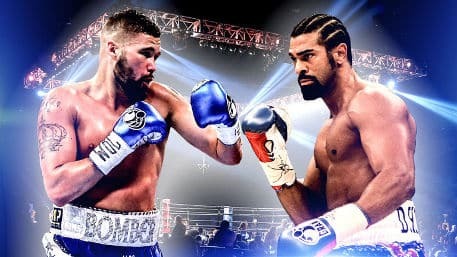 Bellew faces Haye for a rematch at the O2 on Sat 5th May. Read our preview of all the betting offers available, and who bookmakers think will win. The previous fight built up a tremendous amount of hype. Words were exchange for months, and it definitely went too far at times. The amount of aggression almost became a pantomime at times, and it brought the reputation of boxing into dispute. When the fight was over, the pantomime continued. The two boxers instantly shook hands, and paid much respect to each other; almost seemingly apologetic for their previous words. Haye was keen for a rematch and asked for one around ten times in just five minutes. An astute Bellew knew he had control over the rematch, and agreed to nothing that night. The amicable scenes between the two boxers undermined all of the build-up to the fight and made a mockery of it. Fans were left wondering about the authenticity of the rivalry, and whether they had been duped into thinking the fight was more than it was. Therefore the rematch has come as a refreshing change. Sure there have been exchanges of words (they need to sell the PPV event after all) but it has seemed much more reasonable and grounded. This is what the first fight should have been like. Fans can also feel like the injury to Haye took away the fight. The first fight was very entertaining, and the shock result of Bellew winning created headlines, but there was never a fair fight. The outcome would have been very different had it not been for a snapped achilles. This rematch is in many ways, more interesting than the first. Bellew has said there will be no handshakes this time around. He added “this time there will be no rematch. It will all end on Saturday night”. If the bookmakers are right, that David Haye is likely to win, it is probable that both fighters and Sky will be able to sell a final deciding fight. Offers for new customers such as free bets and bonuses can be found on the My Betting Sites homepage. It’s likely that betting offers will become available closer to the fight. When betting sites have them, we’ll add them to the boxing page, and to this page. Money Back if the fight goes the distance – With Betway, place a ‘Round Betting’ bet on the Tony Bellew vs David Haye fight, and if the fight goes the distance, Betway will refund losing bets with a Free Bet equal to your stake, up to £10. Bet 365 have it priced up at 1.33 (accurate at the time of publishing, subject to change) for the fight to not go the distance, so this is the likely option but it’s still good insurance to have for round betting. The only offers available right now are related to accumulators, with 10Bet’s ‘Acca Jacker’ and Betfair’s ‘Acca Edge’, both of which offer accumulator insurance. The fight is being shown on Sky Box Office, at a cost of about £14. This is the only place you will be able to watch the fight in the UK. Coverage starts at 6 pm on Sky, and the fight will start at around 10 pm. Who Is Favourite to Win, Bellew or Haye? Last time Bellew surprised the bookmakers with a win. He was priced 5.50 to win the bout, and Haye was priced as short as 1.14. Even without factoring in the injury Haye suffered, the fight was much closer contended than expected. Going into this fight, Haye remains the favourite, but less so. Bookmakers think Haye will win with odds of 1.44, suggesting a 70% probability he will win, according to our odds converter tool. Bellew is priced up at 2.87, which implies as 35% chance he will win. Will the fight go the distance? Probably not. As we stated earlier, Bet 365 have it priced at 1.33 to not go the distance, which suggests there is a 75% chance that it won’t. The most expected outcome for the fight is for David Haye to win by a KO, TKO or disqualification at 1.80. All odds supplied by Bet 365 are accurate at the time of publishing and are subject to change.